The Cyclist is coming over soon to CYCLE and ack, my leg muscles are killing me from god knows what since I didn't work out at all this week and my place is a wreck and my roommates have left onion peels on the floor in the kitchen and leaves all over the living room and I still haven't made it to the mailbox so there's mail sitting all over my desk and did I even pay the rent this month? AND I have no food to offer him except a packet of dry miso soup mix but no time to go foodshopping and barely any time for a shower and I can barely walk because I'm so sore from the obviously enormous task of rolling out of bed making it doubly embarrassing that he's all buff and in shape and emailed me this morning to let me know he'd be over for our giant bike ride AFTER he went to the gym. He's pumping iron and I'm applying ice packs to my legs so he won't know how hard it'll be for me to pedal. I hope I don't have a heart attack on the trail trying to keep up. Also this is the first time he's going to see my place so it really needs to be spotless.Yikes! 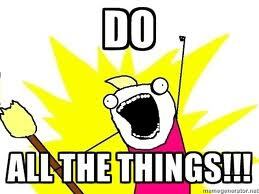 Now I must do all teh things! Tell him you'd like to just enjoy the day and meander along to see the Fall scenery, no rush. Go outside prior to him showing. (with your bike) and do some gentle stretching to try and warm up those (slightly overworked muscles). No need to make excuses for your roomates kitchen etiquette. Lastly, hydrate, have some water to take with, and ask if he'd like to ride out to (brunch, a snack at local eatery, etc.) Be careful out there. Your muscles, if not actually injured, just stiff from overuse will come along after a bit of gentle warm up. Isn't it just easier to LISTEN?